NLA students are making headlines! Read all about our students’ achievements and important announcements on this page. We’re making big news here at Noble Leadership Academy! One of the most beautiful benefits of Islamic schooling is that we celebrate and participate in the blessed month of Ramadan. Alhamdullilah, our Noble students are blessed with the experience of sharing the spirituality of this holy month with each other. Insha’Allah, we will be reducing the amount of homework each night to encourage our families to fully participate in all the activities of Ramadan, from reading Quran together at home, having delicious family Iftars (make it special by having your children invite their friends), praying Taraweeh, etc. We want to make sure our students know and fully understand the special nature of Ramadan. At school, we will be having Quran reading and Dhikr time within our school day, infusing Islamic stories within the curricula, and participating in activities that reinforce the importance of charity. Our goal is to make Ramadan at Noble for our students memorable! We will be starting our Ramadan schedule, 9:30 a.m. to 2:30 p.m. school days, on Monday, May 6, 2019, and ending them on Friday, May 24, 2019. Below you will find a Ramadan Care Link to sign up your family if you need care. If you do not sign up for either before care or after care, and drop your child/ren off early or pick them up late, we will charge the before care or after care price to your account. Please be aware, if we do not receive any signups by May 1, we will not be offering before care and after care. If this happens, the earliest you will be able to drop your child off is 9:15 a.m. and the latest you can pick up your child is at 2:55 p.m. during the Month of Ramadan. We would like to remind you all that Eid Break runs from May 27 through June 5. School reopens on June 6. Click “Menu” on the top left-hand corner. Click “Shop” and add “LED Ramadan and Eid Projector Lamp” to your cart. At checkout, enter the code “noble” in the discount code field. This will waive the shipping fee at checkout. Your item will be available for pick-up at the school on Friday, May 3. Please note that it is important to use the code “noble” at checkout so your purchase will be eligible to participate in the gifting campaign. 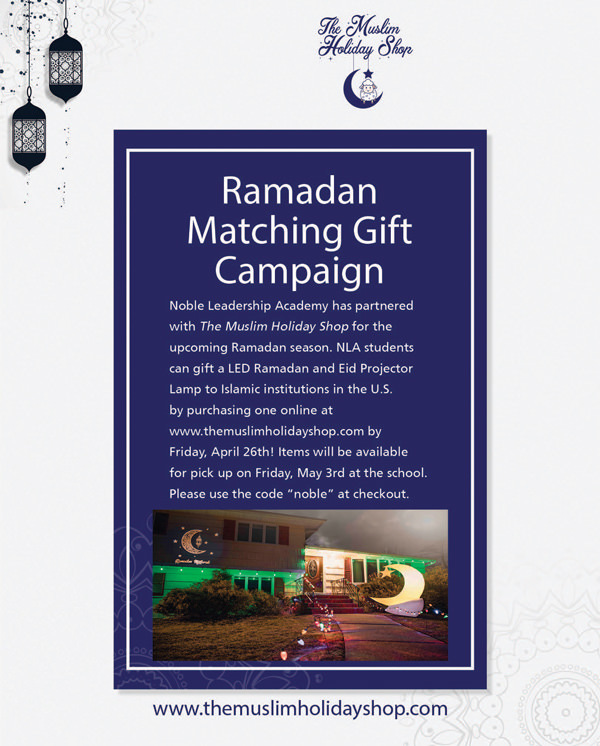 By using the code “noble”, The Muslim Holiday Shop will be able to track how many purchases are eligible to be gifts. Each gift will include a message. For example, if you send a gift to a masjid, the message will say “Please brighten the masjid with this little gift. Love, the students from Noble Leadership Academy”. Please help us make this Ramadan campaign a huge success and enable us to gift to as many mosques and schools as possible! Take advantage of this exciting chance to have your gift illuminate an Islamic institution. We would like to formally invite our Noble family to our annual Culture Day celebration on Friday, April 26, 2019. Each year we transform our cafeteria into a world showcase run by our 6th through 12th grade classes which highlights each country’s food, clothing, dress, arts, history, etc. This year the world showcase countries include Japan, Trinidad, Turkey, Vietnam, Tanzania, Palestine, and Italy. 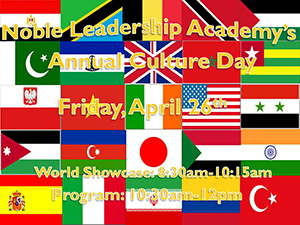 We invite family and friends to experience the world showcase from 8:30 to 10:15 a.m.
After the world showcase ends, our captivating Culture Day program with performances by the elementary students begins in the gym at 10:30 a.m. and ends at noon. We end this day of cultural sharing with a delicious potluck feast. We kindly ask each family to bring in one dish from their heritage to share with the Noble family. The dish should feed about twenty people, if possible. We also ask our parents and students to dress in their culturally representative clothing that, as always, is Islamically appropriate. With Ramadan so close and the excitement increasing daily, Nobles' Aware can't help but think of all the members in our community who do not know where their next meal is coming from. 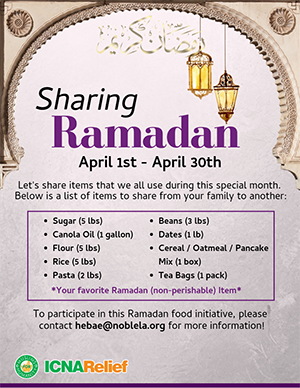 Nobles' Aware is excited to be given the opportunity (and to give our beloved Noble community the opportunity) to support the Islamic Circle of North America in their upcoming Sharing Ramadan Drive. Sharing Ramadan is a program where each family shares a meal with another family in need, right here in the same community. How? By sharing those items that we all use during this special month. All items collected will help ICNA Relief put together 1,000 bags just in time for Ramadan. The bags will be distributed to low-income families all throughout the state of NJ. What Items Are We Asking For? We will be collecting until April 30, 2019, inshallah. If you would like to donate money, Nobles' Aware officers will be delighted to purchase the needed items for members in our community. If you have any other concerns, please email Sr. Heba Eldreny. 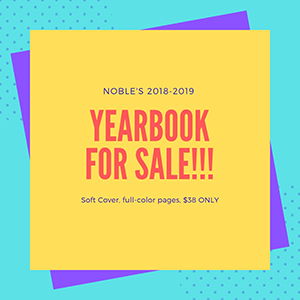 Noble Leadership Academy's Yearbook Committee is excited to announce that our 2018–2019 yearbook is available now on pre-sale for $38.00 through the Lifetouch website. The yearbook has a soft cover with full color pages and includes all students in grades pre-k three through 12th grade. We have a limited amount of books available! Yearbooks will be available for pickup mid-June! If you have any questions, please email Sr. Heba. Through the website you have the ability to purchase the yearbook with a credit card. To pay by credit card go to the Lifetouch website. Our school code is 13519819. If you would like to use a check to purchase your yearbook, please make your check out to Noble Leadership Academy and give to the main office. Please place in an envelope with your child's name on it. Are you interested in advertising your business or office in our school yearbook? Please email Sr. Heba if interested in the opportunity to advertise your business in our yearbook and sponsor the production of our yearbook! View our newsletter to stay updated on what's happening at NLA. Sign up below! Graduates from Noble Leadership Academy go on to achieve great things in life. Visit our Success Stories page, and get inspired today!